Good packing is essential to a good move. Here at Abba Moving, LLC, we understand that in your busy schedule, you may not have the time required to fully prepare yourself for your move. By having Abba Moving, LLC pack for you, we take much of the time and stress out of your move. Our professional moving and storage company staff are experts in packing and unpacking all household goods. Your most fragile possessions will be carefully packed and crated by specialists to ensure maximum protection. Abba Moving, LLC offers the same high-quality packing service. If you choose to do some or all of your own packing in preparation for your relocation, it’s especially important that you be familiar with the techniques that will best protect your possessions. If your shipment includes delicate china, crystal, art, family heirlooms or other items that need special attention, we recommend that you discuss professional packing service with Abba Moving, LLC representative. He’ll be glad to explain costs, materials and the unpacking services available at your new home. 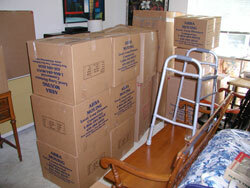 You can depend on Abba Moving, LLC for knowledge and experience in helping you prepare for your move. We are always happy to assist you, answer your questions, and work closely with you to make your relocation from anywhere in the Maryland-DC area as effortless as possible.